Within the organizational circles of the Center for Human Emergence we are guided by chaordic design for the creation of our purpose and principles. Our policy and decision-making processes are supported by ways of Holacracy. In addition, over the years, we experienced that the use and creation of specific languaging opens the space for new energy and application to come into action. A typical example is the unconventional names for the roles in which those who are active within CHE describe our accountabilities. The Purpose and Principles are described here, the current roles can be found here. 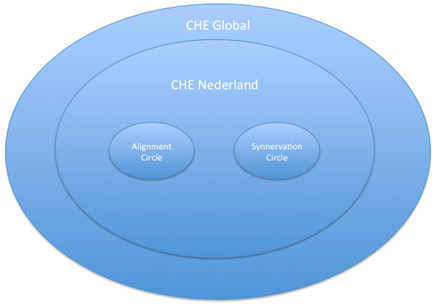 As a governing body, CHE is organized in collaborating self-organizing teams (circles), with a high degree of autonomy. All circles decide on there own definition of roles and accountabilities, depending on the needs for fulfillment of the circle’s purpose. As part of the connection to the entire CHE, each circle has representatives linked to the other circles to ensure swift, precise and efficient information sharing and feedback. As a movement, CHE is jointly created and organized by and through each participant, who feels the intrinsic impulse to do so. This is done in the shape of salons, constellations, projects and gatherings to participate in or to be initiated by you in collaboration with CHE. As a formal organization, CHE is a foundation with three board members. Two of them fulfill roles within the Alignment Circle. The Alignment Circle is the executive committee of CHE NL that comprises projects, constellations and salons. The Synnervation Circle includes CHE Synnervate that holds the commercial and customer related activities. CHE Synnervate meets and moves its customers in taking their natural next step. Synnervate works in the areas of design, development, education and research.